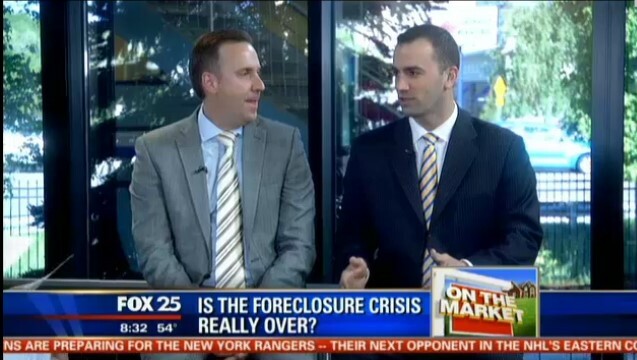 Related blog: Is the Foreclosure Crisis Over? All right Gene thank you very much well if you’re on the market for a new house or if you’re selling yours listen up a new report by the Warren Group says the foreclosure crisis in Massachusetts is officially over so what does it mean for you and should you even believe it, we bring in our real estate experts John and Anthony from Lamacchia Realty good to see you gentlemen this morning. It’s definitely legit and there’s some chatter out there that it’s because the interest rates are low—interest rates have nothing to do with people paying their mortgages. Interest rates are certainly helping the market and helping people being able to afford a bigger home, a larger mortgage, but it has nothing to do with paying the mortgage, the fact is that delinquencies are down, and have been down for two years, and continuing to go down, so now foreclosures are decreasing. The report specifically attributes it to the big drop in March so where’s the threshold here why March why not the month before I know it’s been dropping for two years but at what point do you get to where you say all right it’s over, we’re safe? I’d say we’re at that point I mean March versus last year we’ve seen this part March just two months ago we saw 200 some odd petitions, 1600 last year at that same time so definitely we’re at the bottom we’re probably coming out of it, and keep in mind it should be a part of real estate there’s always going to be some foreclosure directive, and I think a couple hundred is probably at that healthy rate. All right so what does this do to the market? Yeah in the last year and the interesting thing is if you look at foreclosures on the market right now there’s only 500 on the market in Massachusetts compared to last year at this time there was 1300, john and I were talking this morning, and we were remembering 2009 or 2008 to about 2011 there were 3-4000 foreclosures on the market in Massachusetts at a given point in time, in two or three years. And that’s what really hurt pricing, because those are homes that haven’t been cared for a long time and remember if someone is having trouble paying their mortgage they’re certainly not keeping up with the home. How much can you attribute to– I know Attorney General Martha Coakley had been negotiating with the banks because there was a settlement—how much does that play into this? I’d say it played a little bit into it, it’s tough to determine exactly how much, but the government initiatives were there incenting people to do short sales or loan modifications and in some cases even paying down some of the principal, that had an impact. Folks being educated on their options, with loan modifications and short sales, that had an impact, and as Anthony said the increase in the market as far as pricing is giving folks an opportunity to see a light at the end of the tunnel, so they’re holding on now and hopefully in a year or so their home will be right side up. And we don’t even compare, when you think of states like Florida and Nevada that had horrible horrible rates are we one of the first states to come out of this? I wouldn’t say the first, now here’s the thing; we didn’t go down nearly as bad as they did, so from a percentage perspective if you look at Nevada and Florida, Arizona, wow they’re doing better than us but the fact is we didn’t go down as much we were actually pretty insulated which is a scary thought we had a lot of people who struggled here as well but compared to some of those states California, Southern California, they really got hammered, so from a percentage perspective it looks like they’re recovering better but it’s just because they had more. So it’s definitely an across the board improvement and we do not see it changing it’s going to stay this way. Good news that you bring back for my first time coming back for our first time together, I appreciate that! John and Anthony we appreciate you guys being here this morning.